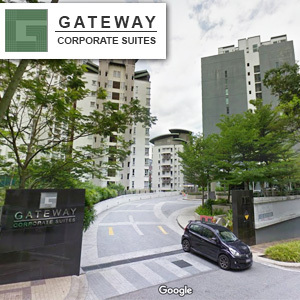 Junior Champs is situated in Gateway Corporate Suites , Gateway Kiaramas , Mont Kiara. Its situated near the Mont Kiara and Hartamas area within Kuala Lumpur, Malaysia and is best known for quality Early Childhood Education programme. Based on a play-based education programme, children who attends their class love their school and teachers. Which explains why they are very attached to our school and provide good quality daycare programme in a safe environment. Our programme caters for as young as 2 years old and up to 6 years old and its fun learning through creative fun and activity corners. 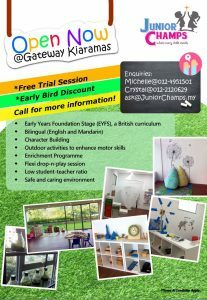 We are not the usual kindergarten with empty play but we you have the best of both world through EYFS an UK approved curriculum blend with a very successful Singapore based teaching methodology making it a unique curriculum that has the long term result. Having said that we have improved it further to inculcate world class award wining Raggio inspired approach into our early learning system. In the afternoon we do provide day care and enrichment programme for our kids so that they can be introduced to many other social and cognitive skills. Out teaching instruction are bi-lingual , intentional but naturally introducing children to acquire early linguistic skills. We envision to provide quality yet affordable preschool education emphasizing also on character and discipline. Junior Champs maybe your neighborhood kindergarten but we aim to develop future leaders of tomorrow and making a difference in society. Every pre-schooler will be nurtured to become well-rounded global citizens with noble values and characters. We are best known for our British syllabus combined with one of the best Singapore preschool system . The combination is essential to provide local education needs for early childhood preparation. In essence we put together well thought experts opinion in establishing our curriculum. Knowledge or skills are acquired by instruction or study. Children learn by experience and by instruction or to study. These comprises of cognitive, motor and social development. In Junior Champs we emphasis on these developments and curriculum are designed to cater for early childhood developments. What studying is not – studying is not only memorizing or regurgitating results whereas it involves applying the mind to the acquisition of knowledge as by reading, investigation and reflecting. You will find in Junior Champs, we provide ample reading corners for reading habits to be cultivated. One of my favorites is a reading corner with mosquito netting covering – a very calm and conducive environment to cultivate reading habits and reflections. We have dedicated areas for science discovery and construction corners for those like investigation and role play . In short it is about conditioning our children through a positive atmosphere of love, encouragement, adapting to failures, and facing challenges. In Junior Champs we endeavor cultivate 9 behavioral conditioning – love , joy , peace , patience , kindness , goodness, faithfulness and self-control. Through it we endeavor to bring about good character such as honesty, integrity, respect, discipline and persistence. Character transformation is utmost important aspect of success in person-hood, relationships , marriage , individual and career. It is the mold to successful life that each parent desires for their children. Each child has unique intelligence and we provide multiple pathways to discovery of individual talents and intelligence. We provide an environment where children learn and socialise with one another with support and guidance from nurturing teachers. We use an eclectic approach where the best of different practices are integrated. Acceptance. Through an environment of acceptance, children will develop a love for lifelong learning. Our wholesome teaching approaches shall help each unique child to excel and fulfill their individual potential. Create true leadership, honing their skills for the future and making them leaders of tomorrow. Equipping children with strong characters and values, to be role models and positively impact and influence their surrounding communities and nations. We place high emphasis in building the children’s godly character as a foundation to becoming a well-rounded, sound individual. Our school and staff will model a culture of good noble characters and values to the next generation. We believe each child is unique and each matters. They will thrive and excel with our wholesome teaching approaches embedded in our loving, caring and nurturing environment. In JuniorChamps, we will foster the keen love for learning, both for the staff and students. We would encourage parents and families to be part of this journey in cultivating lifelong learning. Disciplines are instilled to cultivate good life skills and habits. Promote a culture of mutual respect and honouring one another.